Joining the Jacksonville•Onslow Chamber of Commerce is a investment in your business. Our Chamber is an ADVOCATE for business. As a Chamber member, you become a part of an organization that provides a strong, credible voice that speaks on behalf of business and industry in Eastern Carolina. Our Chamber provides great opportunities to NETWORK with other business professionals. As a Chamber member, you have access to one of the most efficient, effective networking systems available to promote your business and expand your customer base. Membership with the Chamber provides many exclusive BENEFITS. The Jacksonville Onslow Chamber of Commerce works tirelessly to promote its members. We can provide you with resources and referrals to grow your business. Chamber membership adds to your community image. Members who give their time and talents contribute to the SUCCESS of the community. 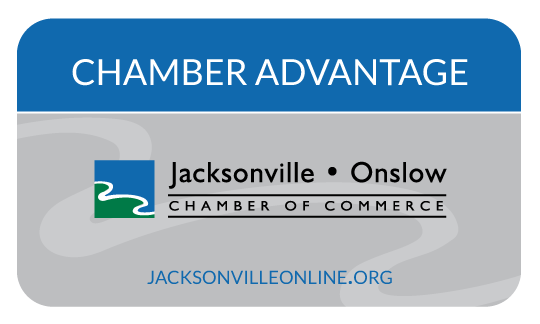 Being a part of the Jacksonville•Onslow Chamber means you’re communicating with other ambitious, growth-minded individuals and businesses. You will benefit from collaborating and discovering similar businesses that have great affiliations, ideas and programs to positively impact your business —and that you never would have heard of without your Chamber involvement. You can increase positive recognition among customers and fellow business owners when you’re identified as a member of the Jacksonville•Onslow Chamber of Commerce. Exclusive Member to Member Discount Program, you can take advantage of discounts offered by Chamber member businesses, that are not available to the public. Discounts your business can offer to increase growth. The Jacksonville•Onslow Chamber provides it’s members with a direct link to a wide range of local and statewide business and community leaders. With ongoing Chamber events, such as the State of the Union Breakfast, Annual Membership Celebration, Small Businesses Week, Forum Onslow, and Military Recognition Receptions, provide insight on issues affecting businesses and Onslow County at large. The Chamber is your advocate in local and state government and works closely with elected officials to create economic prosperity and enhance the quality of life while growing the local economy. Gain access to decision makers and get involved in business issues that impact your business and community. You and your company gain visibility by attending, volunteering ,and sponsoring Chamber programs, website and events. For more information or any questions contact Membership Manager.